The Premier League is the most watched football league in the world and a global marketing phenomenon. Therefore, it’s not really surprising that its 20 football clubs have supporters all over the world. They show their admiration for their favorite club not only in the football stadiums and living rooms around the globe, but also on social media. Especially, the huge followership on social media was reason enough for me to take a deeper look into the social media performance and digital marketing strategies of the clubs. 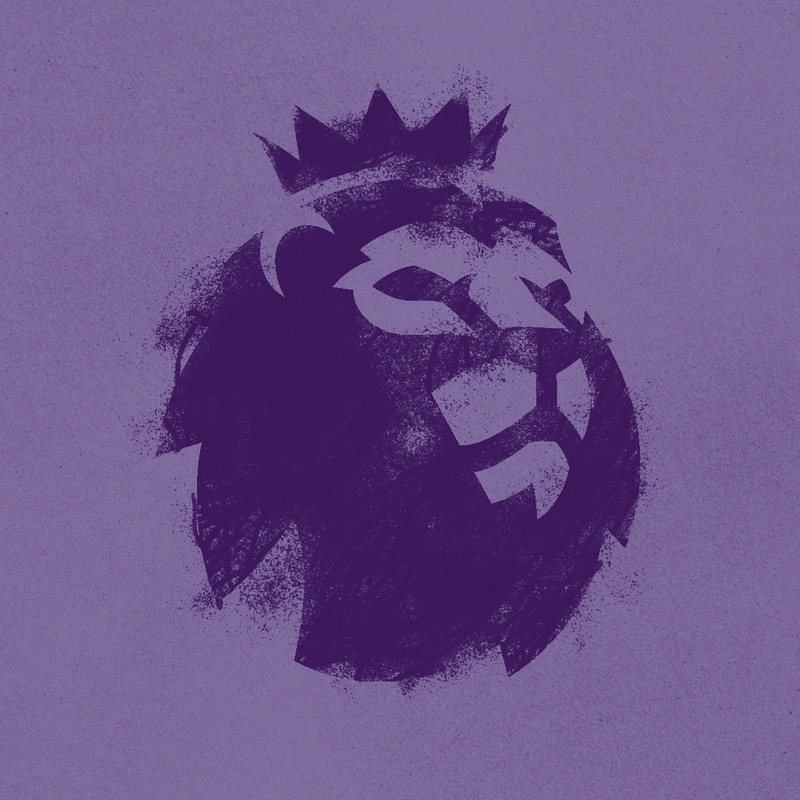 How do the 20 Premier League clubs utilise their social media accounts to interact with their audience? Are photo posts still the dominating post type on Facebook? Does the performance on the pitch have an influence on fan & follower numbers? To provide answers to these questions I didn’t only look at the performance on Facebook, but also on Twitter and Instagram from 1st January, 2018 until the 7th August, 2018. Let us find out who is top of the league and who is close to getting relegated - don’t worry, only social media wise. I started my analysis taking a look at the team with the most posts, because I wanted to know which clubs interact the most with their audience. So who is the most active club on Facebook, Twitter and Instagram? The answer for Facebook: Manchester United. With 2,005 posts the Red Devils are ahead of Brighton & Hove Albion FC, who posted 1,798 times on the social network. A less strong focus on publishing content can be seen for Watford FC with only 478 posts in the same period. That is nearly 5 times less than the team from Manchester. But if you assume that Manchester United is also the team with the highest activity on Twitter, you’re wrong. They only came in eights with 4,403 tweets. Surprisingly, Huddersfield Town dominate the twittersphere in terms of own tweets, with an amount of 6,659 tweets - a tremendous amount of tweets relative to the time period. Bottom of the league for own tweets is Cardiff City FC, with 2,730 tweets. The posting behaviour of the Premier League clubs on Instagram show a head-to-head race between Manchester United and Arsenal FC: United posted 1,117 times and the Gunners United 1,110 times. In contrast to their relatively strong Twitter performance, Newcastle United show less effort on Instagram, with only 51 posts - 21,9x times less than Manchester United, the Magpies are bottom of the league in this category. Not surprisingly, photos are the most used post type. 8,883 images were posted since 1 January 2018 of this season to the Facebook timelines of all Premier League clubs. Interesting fact: The most image posts were made by Tottenham Hotspur with 808 photos. Displaying visual content to their audience with the intent to directly speak to their users and encourage them to comment, like or share the photo posts. The second favorite post type are video posts. Overall, 7,622 video posts were uploaded to the timelines, of which 830 were posted by Manchester City. The Citizens are going strong on using audiovisual content for Facebook; A promising strategy when you consider that Facebook native videos receive 530% more comments than YouTube videos on Facebook.. The third most used post type was the link posts with 7,205 posts. This shows that the clubs still try to attract social media users to their websites. The club with the most link posts was Brighton & Hove Albion FC, who used the format 1,049 times. In contrast, Fulham FC that never used this post type in the last eight months. Live videos are used by nearly every club - 17 out of 20 Premier League clubs make use of this feature. Only Fulham FC, Huddersfield Town and Cardiff City didn’t make use of it. Every football club relies on them and all clubs want to gather as many as possible in their stadiums - Fans. An impressive number to start is the amount of overall Fans for all three networks which is as high as 400 million. In comparison, the United States of America have a population of 326 million citizens. Looking at the specific numbers on Facebook, it becomes clear that the club with the most fans on Facebook is Manchester United. They are dominating in terms of Fans with over 73 million. Runner-up is Chelsea FC with over 47 million Fans. The position was previously held by Arsenal FC but they are now overtaken by the club from Stamford Bridge. That the performance on the pitch can also influence your social media presence can be seen at United’s rivals Manchester City. The newly crowned Premier League title winner over 3,8 million new Facebook fans. The total opposite can be spotted in England’s north. Huddersfield fan base is the smallest of the entire Premier League on each of the networks. 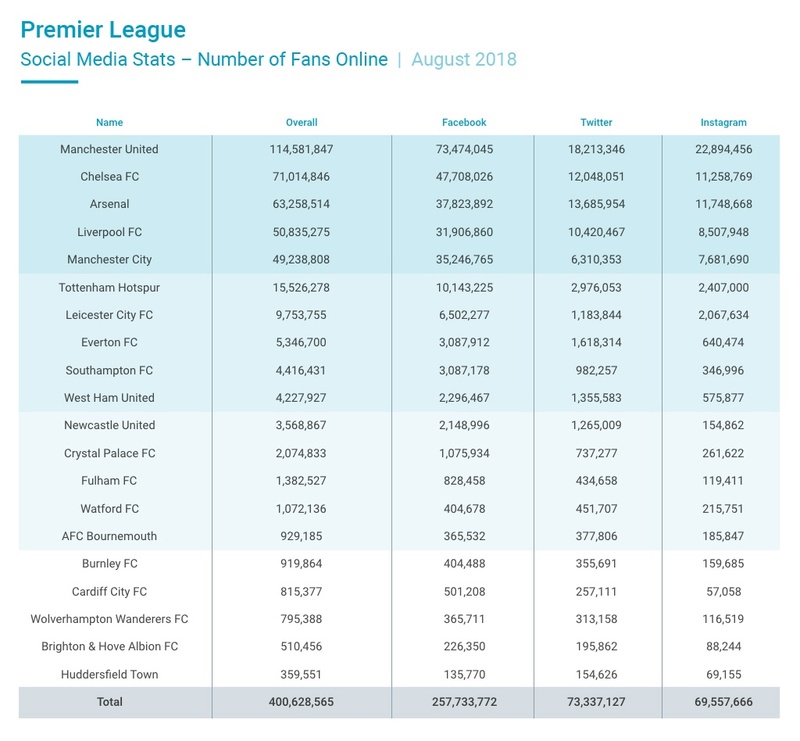 Among all Premier League clubs, the “Terriers” have the least amount of followers on all platforms. But how do the numbers look for Twitter and Instagram? No surprise here: we see a similar picture on Twitter and Instagram. Again the Reds from Manchester are ahead of everyone else with around 18,2 million followers on Twitter and 22,8 million on Instagram. Coming in second place on Twitter is Arsenal FC with a following of 13,6 million. Interesting in this relation is the fact that Mesut Özil's Twitter profile (23,3 million Followers) has more fans than the club his playing for. On Instagram the second places goes to Arsenal FC with 11,7 million fans. Manchester United is not only the most valuable Football club in Europe, but also shows its dominance in the sphere of social media among all Premier League clubs with an overall audience of over 114 million Fans around the globe. Looking at the 'Follower Growth' for all clubs we identified that the likes of Liverpool and Manchester United gained the most new fans in this year. In particular, LFC seem to steadily attract new followers. Already over 3,2 million user clicked the follow button on Liverpool's Instagram profile. That said, Manchester United also managed to gain over 2,7 million new followers within the last 8 months. What an impressive growth. We can see that Manchester United is dominating the social media sphere in terms of fans & followers on Facebook, Instagram and Twitter. That said, it also can be seen from the raw data that the Premier League clubs invest more and more into social media. Meaning, that nearly every team increased the amount of posts and their audience on the three networks, compared to another Premier League Social Media analysis made in 2017. Head to Footballpredictions.net to get a real-time overview of the follower's numbers of the Premier League clubs. For the future it’s going to be interesting to see if the audience numbers will even rise more. Since the start of this year the clubs have already attracted more than 7,3 million new Facebook Fans, 4, million Twitter Followers and 8,2 million users on Instagram. Did I leave out something that is important to you? Looking forward to hearing from you. Simply share your thoughts with me in the comments section.